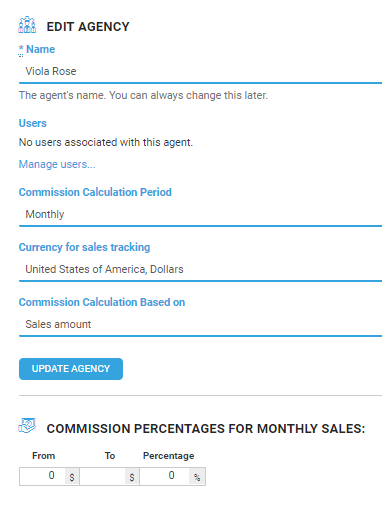 Adding "agencies" to your account allows you to segment sales, invoices, report on your sales by sales agency and track commissions of by sales. Adding Agencies also allows you to limit access to data based on the agency that the user login is associated with. Users from each agency can access your Stitchex account and collaborate on sales for the customers related to that particular agency only. Check the box for the Agents see all customers if you want them to see all customers including those associated with other agents. If this is checked, they will also be able to see the Showroom > Buyer accounts page. 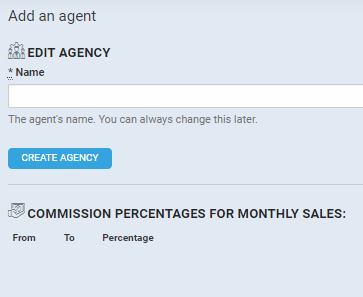 If in the Settings > Agencies "Agents see all customers" is checked, they can see all buyer accounts. If it's unchecked - they can see only their buyer accounts (from their customers). You can also edit the Agency Name by clicking on the edit icon (pencil) at the end of the row (Figure 1). From here you can change the Agency name and Manage (or see) the users who have logins associated with this Agency. If none or listed, you can click "Mange users..." and Stitchex will take you to the Users and Permissions area where you can manage these. To provide an agent with access restricted to the sales associated with a single agency, navigate to Settings > Users & Permissions. You can decide if you want the Agent to have "owner" permissions. The user will only be able to see customers under the Companies page (suppliers and manufacturers will be hidden). Each new customer entered into Stitchex will be automatically associated with the agency. All sales reports will only reflect figures for sales associated with the agency. The user will lose access to all inventory reports other than "Available to sell" which is useful during in-season selling periods. Dashboard data including turnover, sales, and overdue invoices will only reflect sales associated with the agency. Other access is determined via the general permissions settings for the user. Agents will see all products and line sheets. 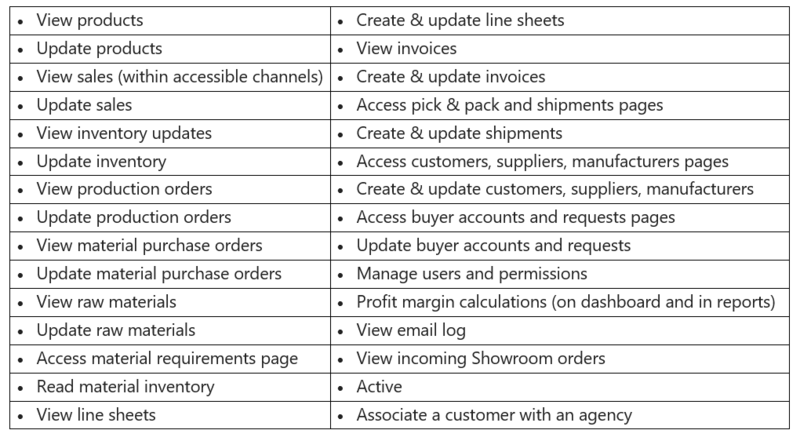 Agents should see only their customers, sales orders or all based on setting (Settings > Agencies > 2 check boxes shown in Figure 1). Agents will see invoices, credit notes, pick tickets/shipments, etc. related to their customer's orders. Agents should not see at all: Production Orders, Purchase Orders, Inventory adjustments, Raw materials, Material requirements, Material inventory, Showroom. They will see the menu options but will receive a message that states the Feature is not included under their plan. Agents should receive notifications . Currently they receive all notifications of other users. 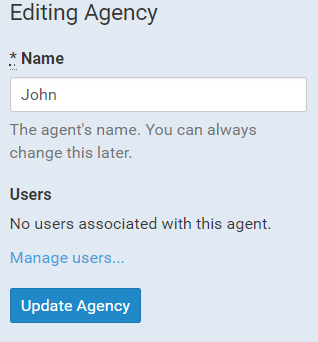 To associate a customer with an agency, navigate to the customer in question, click the pencil/edit icon to edit the customer details and choose the agency from the relevant drop-down. When an agency associated user creates a new customer, the customer is automatically associated with the agency. Scroll to bottom and deselect "Active" to revoke all access for this user. If you remove and then add the user, you will not be charged additional subscription fees as there are no partial month billing fees. Whether they access from the Import History page or the Import Activity page, Agents can only see the import history for the items they import. They cannot see the import history for any other agent. In addition, Agents will not be able to see the Integrations setting on their profile menu (top right corner initial drop down).